Today we celebrate the Feast of St. John the Baptist. One of the things I really like about Christianity is its universality and its adaptability to different cultures. Perhaps the best example of that is the date established for the celebration of Christmas. Unlike the Crucifixion and Resurrection (for which we have strong evidence of their occurrence around the Jewish Passover), we have no evidence as to the time of year when Jesus was born. Similarly, we have no evidence as to when the birth of St. John the Baptist occurred. However, the Church decided that the Feast Day of St. John the Baptist should fall around the Northern Hemisphere summer solstice. June 24 is one of the oldest of the Church feasts and is sometimes called “summer Christmas.” On the eve of the feast, great bonfires were once lighted as a symbol of “the burning and brilliant” light, St. John, who pointed out Christ in this world of darkness. 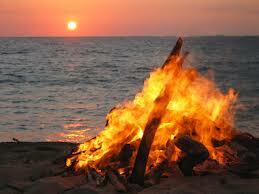 The solstice fires had been pagan, but now they were blessed by the Church in St. John’s honor. There are actual blessings for the bonfire in the Roman liturgy. As we celebrate the Feast of St. John the Baptist, and as the days for those of us in the Northern Hemisphere start to get shorter, may we follow his example of being a light and pointing others to Christ. This entry was posted in Uncategorized and tagged Catholic Feast Days, Christmas, Sol Invictus, solstice, St. John the Baptist. Bookmark the permalink.